Dual champion chaser Master Minded is set to undergo a bone scan on Thursday and may not run for up to three months. 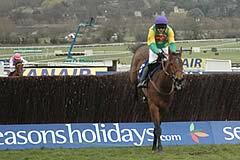 The six year old endured a disappointing return to action, finishing third on his seasonal reappearance at Cheltenham. There were also concerns that he hung to the right during the race and the problem re-emerged while being taken out for a canter on Saturday. Master Minded had been due to run again in the Tingle Creek Chase on 5th December but will instead head to Newmarket for a scan. “If that reveals anything, we can take the appropriate action,” said Nicholls, after announcing the change to his plans. If he does make the big race, Master Minded will be in line for a second successive Queen Mother win, after Ruby Walsh led him to victory there last season. Despite today's news, he remains a 3.9 ante-post favourite to win the race, with Big Zeb 5.4 and Master Minded's recent conqueror, Well Chief, available at 9.0. Meanwhile, stablemate Denman, is set to get his jump season underway in this Saturday's Hennessey Gold Cup at Newbury. The Irish bred star may be top weight for the race but he still has plenty of support from punters and is set to go off as favourite, as he attempts to regain the crown he last won in 2007.